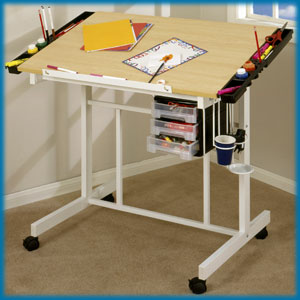 This all-in-one tabletop craft station will have you working in ease and comfort no matter your craft of choice. The Studio Designs Deluxe Craft Station is built for convenience, ease, and comfort. With a 24" x 36" top surface, you'll have plenty of room to write, pain, sketch, or cartoon. The top angle adjusts up to forty-five degrees with a finger-touch system which allows you to customize your work environment with ease. Two side trays are perfect for storing all of your tools including paint, pens, pencils, brushes, or whatever accessories you might need. The metal frame holder includes a drip tray for glue guns; a must-have for the multi-media crafter. You'll have plenty of storage space in the three plastic molded slide-out drawers, included in the assembly. The entire apparatus is fitted on casters for maximum mobility so that it can be where you want it, when you want it. Please note that this item incurs and oversized shipping charge of $57.45. Lots of convenient storage and like the size and portability. The directions for putting it together are a bit unclear and the quality isn't 100% - the white coating chips off very easily. But for the price it's not bad.